Chul-Hyun Ahn, 'Two Squares' (2016). Plywood, color-changing LED lights, mirrors, 61.5 x 61.5 x 10 inches. On view at Erin Cluley Gallery at Dallas Art Fair. Image courtesy of the Artist and Erin Cluley Gallery. Dallas Art Fair returns to the southern metropolis for its eleventh iteration with an international exhibitor list, reaching as far as Asia and Middle East in addition to a wide range of Texan galleries. The global affair will once again occupy the Fashion Industry Gallery located at the Dallas Arts District with close to one hundred booths, showcasing a range of artists—including established names and international discoveries. The fair plays a key role as a gathering hub during a busy cultural week in Dallas through collaborations with local fixtures, like SOLUNA International Music and Arts Festival and The Power Station. The fair’s kick-off will coincide with the annual Preview Benefit, which benefits the Dallas Museum of Art, Nasher Sculpture Center, and Dallas Contemporary through its ticket sales. “There is a Texan charm and hospitality here that’s hard to find elsewhere. I think that’s part of the reason why people enjoy coming back. Galleries from around the world feel welcome in Dallas,” fair director Kelly Cornell told Cultured. Our contributor Osman Can Yerebakan selected his highlights. And if you’re there, head to the River Bend Grand Opening Celebration on Wednesday, April 10, from 6-8PM, where Cultured is partnering with the fair for the opening night party. Check out a site-specific installation and book-signing by artist Clare Woods, SOLUNA performance by Icelandic artist Egill Saebjornsson, and visit the galleries opening late: 214 Projects, AND NOW, and Erin Cluley Gallery. RSVP at rsvp@dallasartfair.com. We’re also partnering with Nasher Sculpture Center for the 360 Speaker Series on April 13 at 2PM, with a talk entitled Leveling the Playing Field: What Pro Sports Can Offer the Gallery System, including panelists William Powhida and Magdalena Sawon and moderator Tim Schneider. RSVP here. 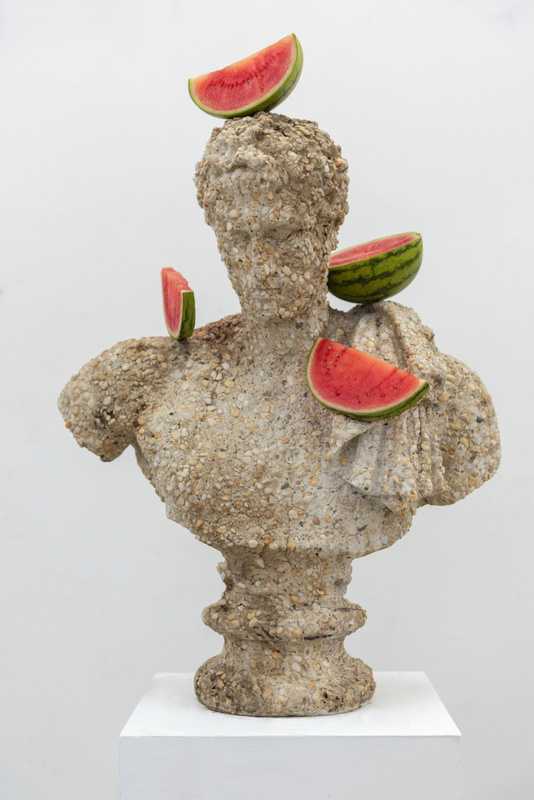 Tony Matelli, Bust (w watermelons) (2019). Concrete, painted urethan. A gallery hailing from Chelsea, Marlborough joins the fair with a large selection of artists from the gallery’s roster. Tony Matelli’s striking sculptures, in which the artist pairs pieces of perishing food with human form, spills outside the gallery’s booth and takes over the lobby of The Joule Hotel. Slices of ham draping from a bronze headless figure, or bananas gracing the head of a crumbling female sculpture, filter emblematic yet equally generic figures of art history through a humorous lens. Marlborough booth furthers its light-hearted accent in their selection with Keith Mayerson’s rendering of Jane Fonda in her iconic Western character Cat Ballou in an eponymous oil on linen painting. Brie Ruais, Topology of a Garden, Northeast, 135lbs (2018). Pigmented clay, acrylic paint, hardware. 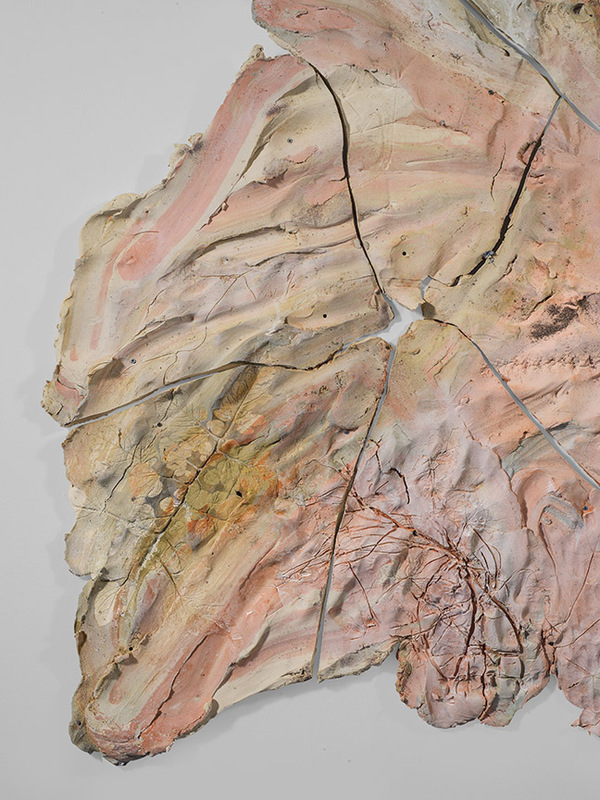 Another addition from New York’s gallery hub is albertz benda, with a three-person presentation of Zoë Buckman, Timothy Curtis and Brie Ruais, whose clay wall pieces of bursting energy are equal to her own body weight. Containing a dusty color palette in reference to the topography of the American South, the Californian deepens her relationship with her tactile medium through mountainous formations and smears of colors on surface. Ruais, whose energetic, earthy sculptures reminisce Jay DeFeo, was amongst the artists included in the permanent collection of the Dallas Museum of Art by the fair’s Acquisition Program last year. The fair also serves a preview for the works Ruais will exhibit in her upcoming exhibition, Ways, at the gallery’s Chelsea location in early May. 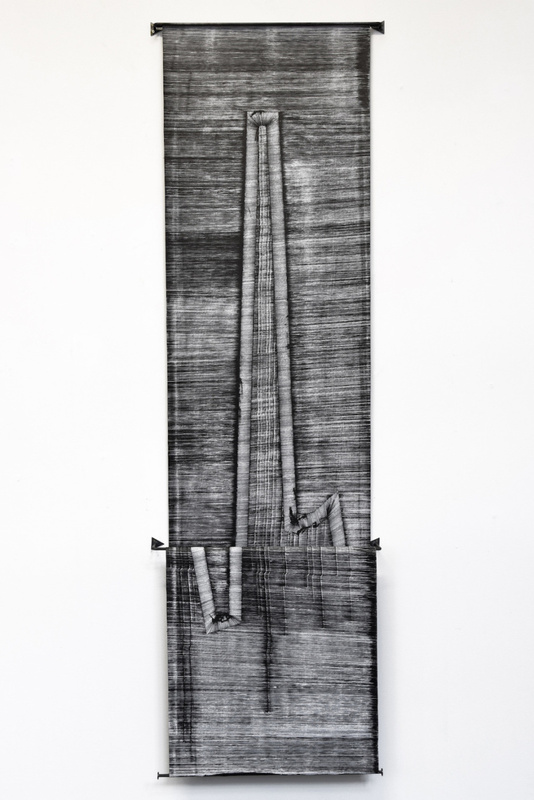 Samuel Levi Jones, Intercalate (2018). Deconstructed print portfolios on canvas, 60 x 55 inches. © Samuel Levi Jones. Courtesy Galerie Lelong & Co., New York. The Paris and New York-based gallery will introduce a museum quality artist list, bringing to Dallas historic works by Ana Mendieta, Hélio Oiticica, and Mildred Thompson, as well as recent works by Alfredo Jaar, Jaume Plensa, Samuel Levi Jones, and Ursula von Rydingsvard. 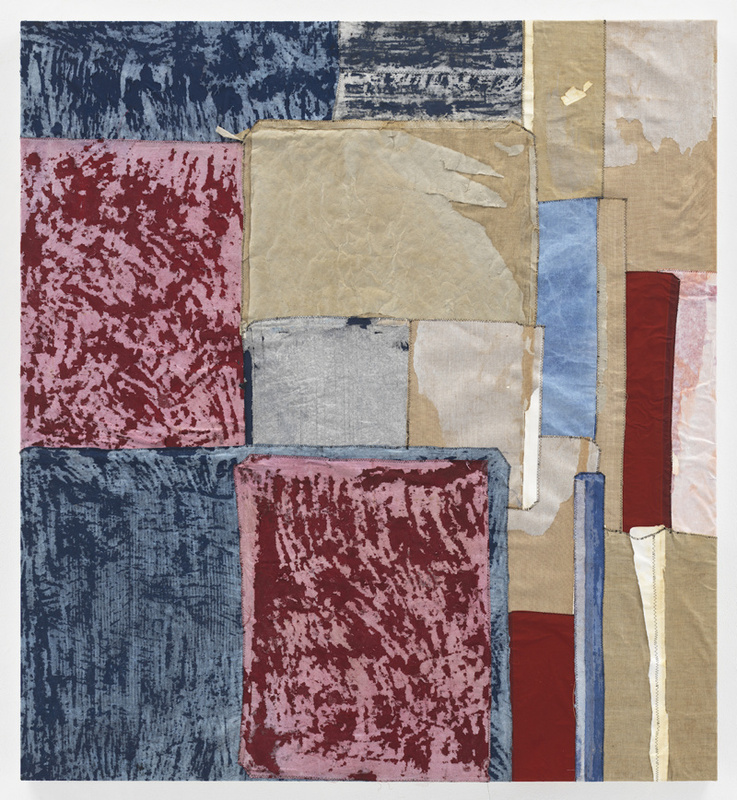 Jones’s tapestry-like painting of deconstructed print portfolios on canvas, titled Intercalate (2018), will compliment Mendieta’s heartbreaking photograph of her silhouette lying on ghostly Iowa land from 1978. Arcmanoro Niles, When You Give Your Love Away (2018). Oil, acrylic and glitter on canvas, 68 x 36 inches. Lower Manhattan is represented by a group of galleries, among which the neighborhood veteran Rachel Uffner Gallery brings a multi-genre selection, including framed glass works by Sara Greenberger Rafferty, Bianca Beck’s biomorphic papier-mâché sculptures of neon hues, and amusingly colorful and charmingly geometric oil on canvas portraits by Leonhard Hurzlmeier. A stand out is a mixed-media painting by Arcmanoro Niles, titled When You Give Your Love Away (2018). 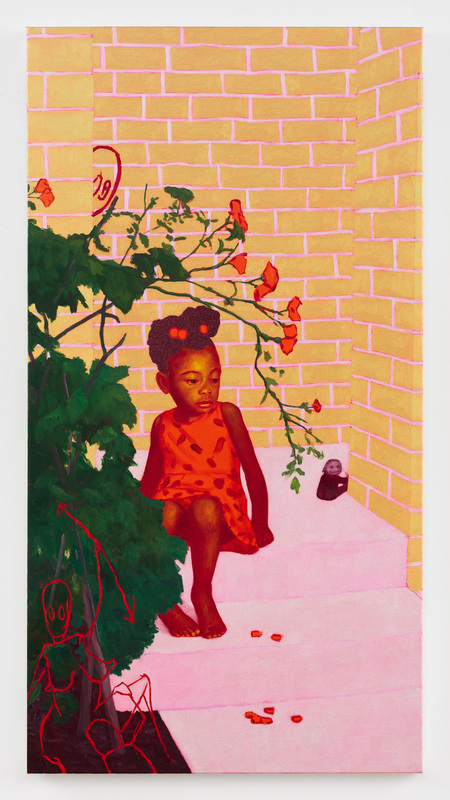 Niles’s bittersweet depiction of a little girl offers a glimpse of the artist’s ongoing solo exhibition, My Heart is Like Paper: Let the Old Ways Die, showcasing his equally vibrant paintings at the gallery’s Lower East Side location. “We are hoping this piece will join the esteemed collection of the Dallas Museum of Art,” said Uffner to Cultured over email. Amelie Bouvier, Movements and Disruptions #3 (2017). Indian ink on canvas and metal 86 3/6 x 20 1/2 inches. Brussels-based gallery Harlan Levey Projects tested the waters in Dallas with an exhibition of young Belgian artist Emmanuel Van der Auwera at Dallas Art Fair’s extension space 214 Projects last month. The gallery saves its booth for France-born artist Amélie Bouvier’s Pickering’s Harem and Movements and Disruptions series, composed of curtain-like draping canvases covered in Indian ink. The artist’s work turns researched data into abstraction, commenting on ephemeral and transient states of information and memory. Amba Sayal-Bennett, Midnight Road (2018). Ink, pro-marker, graphite on paper. Bridging the American South with the Middle East is Dubai’s Carbon.12, located at the Emirati city’s gallery district Alserkal Avenue, where the gallery currently exhibits a solo exhibition of paintings by Austrian artist Bernhard Buhmann. 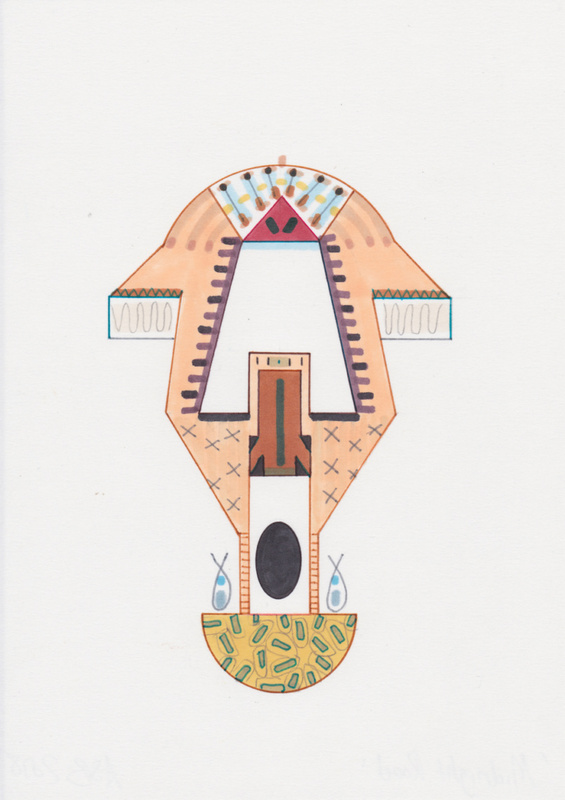 The artist’s lustrous geometric abstractions make their way to Dallas alongside other artists from the gallery’s roster, including Sara Rahbar with her war gear assemblage, Be tender with me (2018), and Amba Sayal-Bennett, who makes equally architectural and corporal pastel-colored graphites on paper. California-based painter André Butzer, who will open a solo exhibition at New York’s Metro Pictures in early summer, joins the booth with two cartoonish drawings, borrowing innocent and eerie cues from children’s drawings. Dallas Art Fair runs through April 14, 2019.